In April of this year, Russia decided to suspend the basic Common Forces in Europe Treaty. We wanted to save the treaty, but we also wanted it tailored to reality. 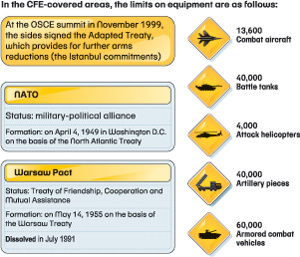 The basic Agreement was signed in 1990 when the Soviet Union and the Warsaw Pact were still in place. With no changes made throughout the 1990s, it became obvious to us that the treaty had long become obsolete. Russia was one of the most active participants in the drafting of a new treaty in 1999. We not only ratified the treaty but also fulfilled all related commitments. We expected all of our 34 partners in the treaty to follow suit, but so far only three countries have reciprocated. We now consider continued observance of the basic CFE Treaty absurd. The treaty is written and based on past issues (take, for example, its references to the now-defunct Soviet Baltic Military District). On the other hand, the treaty's provisions are unfair to Russia. It allows NATO countries to deploy additional military bases in Central and Eastern Europe and monitor Russia's military activities, but not the other way around. The Baltic nations are not covered by it at all. The document also defines certain "flank restrictions," which limit Russia's military presence in its northern and southern regions, including the unstable Caucasus. Put together, these factors are dangerous for Russian national security. Over some time, Russia urged its partners to display responsibility and ratify the modified treaty, but was met with no response. Under the circumstances, we decided to suspend the treaty. Our aim is not to end the CFE Treaty, but we do want our partners to understand we are not prepared to abide by its unequal provisions. We will go back on the moratorium as soon as our NATO partners ratify the adapted treaty and put an end to the legal nonsense that has existed for over 15 years. To end on a positive note, we should be clear that Russia's decision to suspend the treaty should not lead to any geopolitical changes in Europe. Of course, Russia will continue to comply to its fundamental provisions and is not interested in upsetting the balance by arms buildup.